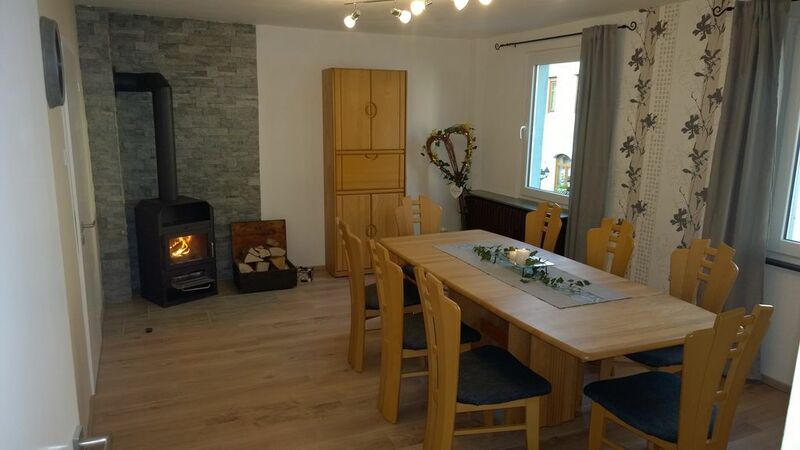 The apartment Kylltal is located in the heart of the Eifel village Birresborn, and offers on its 210m ² cozy, spacious and comfortable leisure time for up to 10 people. The apartment, completely renovated in 2017, is the ideal starting point for cycling, hiking or fly fishing on the Kyll. The apartment is spread over two floors and offers a living room with a large living area and flat screen TV, a dining room with a fireplace, a comfortable kitchen, Dishwasher, 3 double bedrooms, 1 bedroom with bunk bed, 2 bathrooms and 2 balconies. One of the bedrooms has a sofa bed, which is available as an additional sleeping accommodation for two people if needed. A special highlight is the sauna and relaxation area. On a total of 35m ², you can relax after an eventful day and let your mind wander. You can store your bicycles safely in a storage room. The apartment, completely refurbished in 2017, offers space for up to 10 people on a living space of approx. 210 sqm. The apartment has a total of 4-5 bedrooms. Space for 2-4 persons. Equipped with a double bed and additionally with a sofa, which is available as a sofa bed for two children (or adults). Preferably for two children. Equipped with a bunk bed. The beds have the dimensions 0.9mx2m, and could also be used by adults. Each floor offers a spacious bathroom, with shower, toilet, and 1-2 pool. The modern fitted kitchen is equipped with an oven, 4 ceramic hob hob, refrigerator and dishwasher. In the cupboards you will find dishes for 10 people as well as the necessary kitchen utensils. And, of course, we have also provided a machine for a delicious cup of coffee. There is also an ironing board and an iron. Next to the kitchen is the dining room, with space for the whole group. On a cool day, a stove creates a cozy atmosphere and invites you to linger. There is a high chair for toddlers. A large living area in the living room, is certainly the central meeting point after an exciting holiday. The ideal place to relax, for pleasant conversations, games, or to watch TV on the 52 "flat screen TV. Various company games as well as a small book collection are available. This includes a Finnish sauna (2mX2m), a shower, and a relaxation area with sunbathing areas. You also have direct access to the courtyard, where you can cool off the outside views. For a bike ride we can provide you with two adult bikes and two children's bikes. If you need more or the sizes do not fit, you can rent bikes in the village for a fee. Birresborn lies in the Vulkaneifel at about 350 m above sea level and is part of the natural and geopark Vulkaneifel. The salm forest, of which large parts belong to Birresborn, is one of the core and resting zones of the natural park. About 65% of the total area of ​​2. 087 ha is wooded and invites to extensive walks and hikes. The Kylltal cycle path leading through our town as well as the close connection to the Eifelsteig inspire guests and locals at the same time. Particularly worth mentioning is the paradise for fly-fishing: the Kyll. Well-known far beyond the borders of our region, fly fishing in Birresborn is very popular. In the village there is a baker, two restaurants with a good kitchen, a vegetable garden and, in case of emergency, a doctor and a bicycle dealer / Werkstadt. Everything within walking distance. The best shopping is in the larger neighboring town Gerolstein, which is about 10 minutes away. The train station with direct connection to Cologne and Trier is only a few minutes walk from the apartment. Ich gebe der Wohnung 4 Sterne. Die Einrichtung ist sehr schön und geschmackvoll, es ist unglaublich viel Platz, es gibt einen Kicker, und eine Dartscheibe, die Sauna war gut - alles in allem wirklich super. Der einzige Nachteil war die Straße, es ist unglaublich laut und befahren, so dass man nachts die Fenster schließen musste. Aber wir haben einfach die Türen aufgemacht zum Flur, und dann ging es gut. Ich kann die Wohnung weiter empfehlen, wir haben uns sehr wohlgefühlt. Vielen Dank. Tolle Wohnung mit kompletter Ausstattung, super sauber, unkomplizierter Kontakt. Wir waren bereits das zweite Mal da und kommen sicherlich wieder! Wir hatten einen tollen Mädelstrip nach Birresborn. Tolle Landschaft, saubere und gemütliche Wohnung und netter Vermieter. Genügend Zimmer, ein freundlicher Vermieter und eine gute Ausstattung. Was will man mehr? Wir kommen gerne wieder. Küche groß, Eßzimmer groß, Wohnzimmer groß, Saunabereich groß, alles sehr liebevoll eingerichtet, nette zurückhaltende Vermieter. Wir kommen wieder.